Lowdown: Issues of morality can and should be assessed using scientific tools. Of the self proclaimed four horseman of New Atheism, Sam Harris was the sole remaining member whose books I never read. 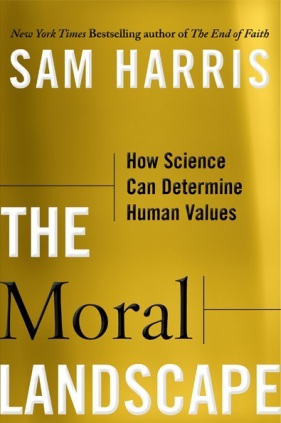 Given his comrades include Richard Dawkins, Daniel Dennett and Christopher Hitchens I already knew that here was a guy I’d love to host for a dinner and a chat, but Harris had to wait till The Moral Landscape for me to read a book of his. In his philosophical book The Moral Landscape Harris is raising a revolutionary claim. Science, says Harris, can be used to determine the preferred option of any moral dilemma we face. This is no subtle claim to make, hence Harris having to write a whole book to defend his claim. Defend it he does; he sure managed to convince me. It’s the implications of his claim that are interesting, and this is where The Moral Landscape spends most of its time. First, when making the claim that science should be used to arbiter ethical issues, one is effectively making the claim that there are better options and lesser options. Making such claims puts you on a collision course with popular relativism that says things like “all beliefs have equal claim”, “all cultures have equal claim”, and “scientists should tell us about science but leave the politics for the rest of us”. In effect, Harris is saying that science can and should have direct saying in matters of politics. When Harris claims that one option is better than the other, and that its superiority can be proven, he has to offer a framework with which to measure such superiority. The framework he offers is one of optimization: according to Harris, the question most of us would like answered when dealing with issues of morality is the question of maximizing the well being of conscious living things. A lot of room is devoted to discussions on what “well being” is, probably because it is not a term that can be sharply defined. Harris would tell you that inability to define the term does not necessarily mean well being is not a good measure: we are unable to define what a healthy person is, either, yet that does not prevent us all from wanting to be healthy and from taking measures to ensure we are. Most of us would say that we use our values in order to pass judgment on ethical matters. Harris argues that values are direct the direct result of facts, or at least perceived facts, which again paves the way for his core argument. In similar fashion and in clear language full of interesting examples Harris goes on to tackle hurdle after hurdle, with religion winning itself a dedicated chapter. Personally, I have enjoyed the book's discussion on free will the most, because the question of whether we are truly in control of our lives is one of the most interesting philosophical questions I have encountered. If there is anything that is missing from The Moral Landscape it’s actual steps or directions to take in order to start making our world better by making scientifically guided choices. That is not the book’s point; Harris openly admits this is an area we’re pretty ignorant about. The entire point of The Moral Landscape is to create the urge to establish such a discipline. So far in this review I have done what I normally do when I encounter a book about which I don’t have much to say of my own: I provided a summary of the book’s arguments. The interesting question then becomes, why is it that I have so little to say about the book otherwise? The answer is complicated. It starts be me pointing at the undeniable fact The Moral Landscape is a book dealing deeply complicated matters of philosophy for which my normal shoot from the hip level reactions are no match. Indeed, I can report that The Moral Landscape, despite using simple and down to earth language, is no easy read; a lot of thought needs to be paid while reading it. Reading it on train rides, with all the ensuing noise and distractions they offer, is not the way in which a book like The Moral Landscape should be read. Yet that’s exactly how I read it for I had no choice. The most amazing thing happened while reading The Moral Landscape, train distractions or not: as I read one revolutionary idea after the other, I knew I was reading some ground breaking stuff yet it all seemed to make perfect sense to me. It felt as if Harris was telling me things I already know. I mean, it seems perfectly clear to me to argue that science has a saying in matters of morality: after all, there is a thing out there called “the truth”, and thus far the best method we developed for dealing with it is science; to say that truth applies in one case but not in another is a rather foolish thing to do when it is clear such exclusions are only made for the benefit of specific individuals and/or specific agendas. There is also the matter of matter. We are all made of it, and everything we know and experience is the direct result of matter and material interactions alone: matter interacts before us, and matter interacts inside our brains to make us feel stuff. Given that everything we deal with in this world is of matter, and given that science is the only viable tool at our disposal for assessing matters of matter, then it is clear to me science has a saying in everything. My casual observations don’t take anything away from the revolutionary nature of Sam Harris’ claims and from his achievement of putting them on the agenda. What seems obvious to me a second after I read it was not obvious at all before I read it, and will still not be obvious to the majority of this world’s population that prefers to follow unfounded moralities derived from Bronze Age scriptures over what contemporary advanced sources can provide. In this one can clearly observe a straight line connecting Harris’ previous books, Letter to a Christian Nation and The End of Faith, with The Moral Landscape. Given the doors opened by The Moral Landscape, perhaps I should devote more of my time to reading Harris' other books. Overall: You would rarely find a book raising more important original ideas than The Moral Landscape. 4 out of 5 stars. Did you see that Harris is offering $1000/2000 for the best counter-argument? And $10000/20000 if it actually convinces him? I like that. Maybe I’ll get the book even though I wasn’t that crazy about the Free Will one. And I also think you should read the book and tell me if/why you disagree, because it totally convinced me. I actually find looking at life's morality question as an exercise in minimizing suffering and maximizing social benefits quite helpful when it comes to decision making. In general, this book is a much more thorough affair than Free Will. If you will read Moral Landscape you will see Free Will is just a spinoff.